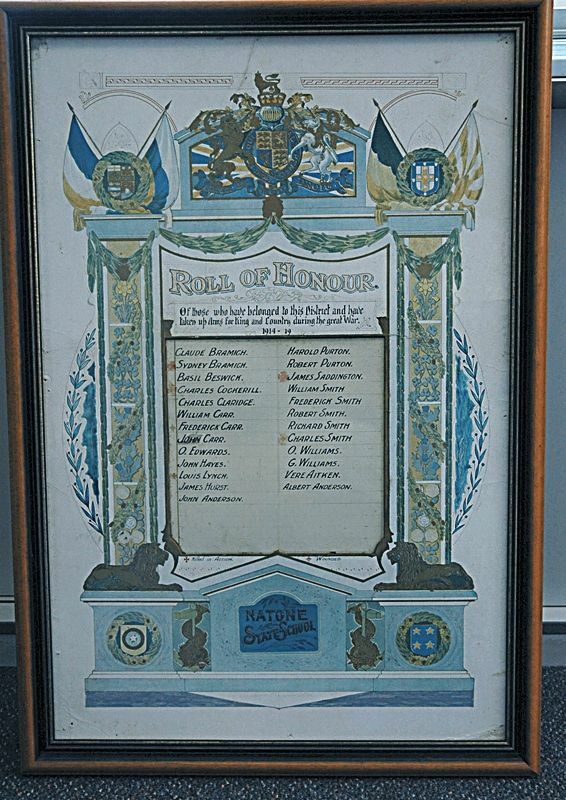 A framed paper honour roll from the previous Natone School commemorates those from the District who served in World War One. It is elaborately decorated with the Royal Crest on a Union Jack at the top, which are flanked with the flags of four of the allies of World War One. It was very fitting that Empire Day should have been selected as the occasion for the residents of Natone to show their appreciation publicly of those who have enlisted for service in the Empire's cause from Natone, by providing for the perpetuation of their names. It was a large crowd, and one representative of the whole district, that assembled at the Natone State School to witness the unveiling of a roll of honor which will be hung in the State School there. The building was artistically decorated with miniature flags, and red, white, and blue streamers. Patriotic addresses were delivered by the Warden and Capt. Piercey. The Union Jack which covered the roll was then withdrawn by Mrs. Carr and Miss Aitken. Three hearty cheers were given for those whose names were inscribed on the roll, which was followed by the singing of "For They Are Jolly Good Fellows.'' Miss Rutherford sang, 'God Bless Our Soldiers." The North Western Advocate and the Emu Bay Times, 23th May 1918.